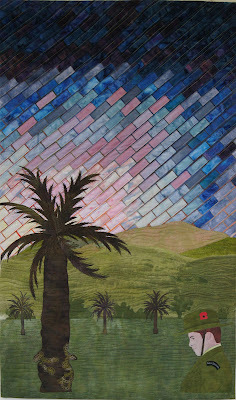 I finished my Gloria Loughman landscape quilt, which was started in a workshop 2 weeks ago. I don't 'do' landscapes because I want them to be realistic, so this was an exercise in dealing with something almost abstract. I didn't have an actual picture of my landscape, so I think it helped me be less perfect in the design. I took photos of some of the aspects, but overall it was a memory picture. Also, I had wanted to use what I learned in class in another of my ANZAC banners (as boring as it is to many people it may not be every one's cup of tea, but to me, there are many stories to be told). When I attended this year's ANZAC dawn service at our local military camp, Linton (and also my workplace), I watched the sunrise through one of the Camp's many huge palm trees. There was also a very tall soldier standing in front of me, so I got his silhouette and the tree with the sun lightening the sky over the Tararua Ranges. Here is a close-up of the soldier - to ensure that the lightness of his face didn't distract too much, I covered the fabric with fine tulle. Most of the green fabric has been painted with fabric paint - I needed to get a variation for depth of field. All I need now is a title. It is lovely -- I like your sky, but especially LOVE your trees. Can't wait to see it in person. Thank you. Still need a title to finish off with a label!